Reports from leading Russian research institutes bear witness of a trend which ultimately could significantly change the country’s northern territories. Both June and July were among the warmest on record. Average air temperatures in the region were between four and eight degrees celsius above normal, a report from the Russian Hydrometeorological Center reads. In the Nenets Autonomous Okrug, the Arctic region located along the Pechora Sea, a lasting heatwave brought temperatures to more than 30 degrees, the Center informs. In the neighboring Yamal-Nenets Okrug, a state of emergency was declared as extreme heat combined with dry winds for up to 1,5 month raged across the tundra. More than 20 major wildfires pushed regional emergency personnel to the limits. Also Arctic water temperatures are on the rise. Ocean surface waters in the Barents Sea are up to three degrees higher than normal, the research measurements show. The trend has dramatic consequences for the Arctic sea ice. All along Russia’s Arctic coast ice layers are shrinking quicker than ever. In the western part of the East Siberian Sea, there was 69 percent less ice than normal in the days 7-9th August, the Hydrometeorological Center writes in a press release. In the northeastern part of the Kara Sea, the ice layers are down 52 percent, and in the southwestern part - 31 percent. 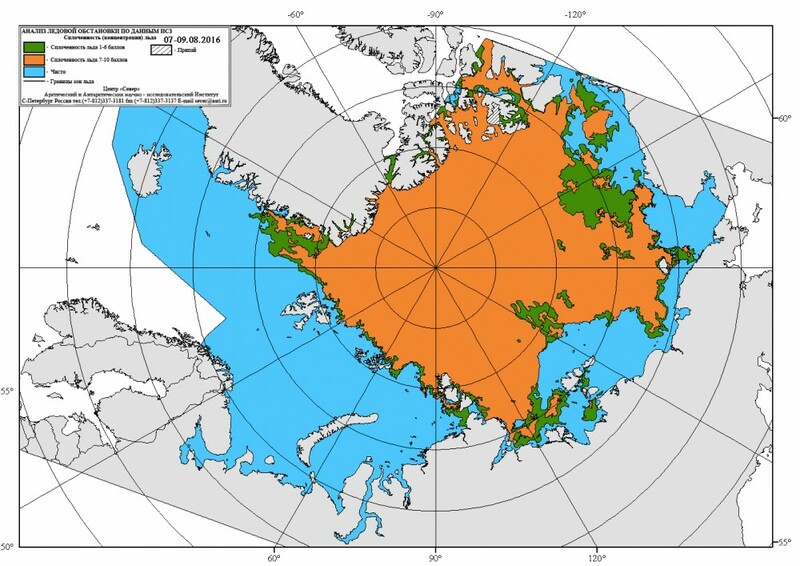 In the western part of the Laptev Sea there is 23 percent less ice. In all of the Arctic, ice now covers 7,4 million square kilometers, which is 18 percent less than the norm for early August. The ice data is collected by the Hydrometeorological Center together with the Arctic and Antarctic Research Institute and research center Planeta. The data stretch back to year 1978. The figures are in line with information presented in early July by the U.S.-based National Snow and Ice Data Center. In June, the Arctic sea ice retreated to the lowest extent for that month since satellite records began in 1979, the Center informed. Melting Russian Arctic ice open new routes for the shipping industry. Information from the Northern Sea Route Information Office shows that as many as 68 vessels were sailing along, or en route to, the Northern Sea Route on 10th August. A lion’s share of the ships are on missions along the Yamal Peninsula and in the Gulf of Ob, the data say.